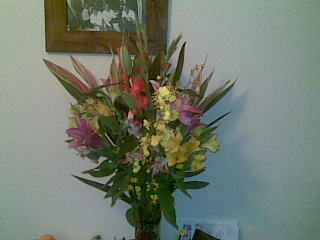 Came home from our impromptu ethnic feast to a huge bunch of flowers. For no reason other than he thought they were pretty and I might like them. What a man! I am a lucky girl, ne! And Im glad he appreciates you! What a good boy! Im off to see Michael Franti and Spearhead tonight with a very nice man who got us tickets… Im pretty excited!